Cook the noodles, then drain. Add soup, mix thoroughly. Add tuna, mix thoroughly. Add peas, mix thoroughly. Spread mixture in 9″ by 13″ baking pan. Put slices of cheese on top. Crumble chips on top of that. Bake at 350 degrees for 30 minutes or until cheese is very lightly browned. I loved this stuff growing up. We would have it every two weeks or so and I would happily eat the leftovers until they were all gone. Naturally, with a recipe I liked so much, I started making it on my own when I moved out. I would make it roughly once a month and eat it for leftovers for three days. By myself, I could literally get five meals out of a pan. As time wore on, I gradually began to modify the recipe a bit in order to make it healthier without reducing the qualities I liked about it. Here’s what I make today. This recipe has about 12 servings in it – I’ll eat two servings if it’s the only item for the meal. Each serving has roughly 8 grams of fat, so while it’s not the most healthy thing, it’s pretty good. It takes about 30 minutes to prepare a single pan of this casserole and the ingredients add up to about $11 per pan. (Most of the time is invested in boiling the noodles.) That creates a per-serving cost of $0.92 – not bad. I’ll eat two servings for dinner, as will my wife, and our children will each eat one serving. Then, for lunch the next day, my wife and I will each eat two more servings, then I’ll often eat the final two servings a couple days after that for lunch. All for $11 – not bad at all! But, with some advance planning, I can not only drop that price per casserole a fair amount, I can also shave the time per casserole. Both goals are achieved using the same technique – simply making a quadruple batch. 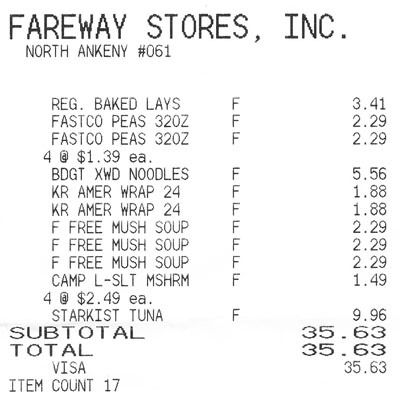 The ingredients for four pans cost $35.63 – or $8.91 per pan. That’s a savings of $2.09 on each pan – a total savings of $8.37. That’s definitely a good way to start! This is a great example of how buying bulk items can pay off. Since I needed such a large quantity of each item, I was able to compare all of the prices per unit – and I chose the version with the lowest price per unit in each case. 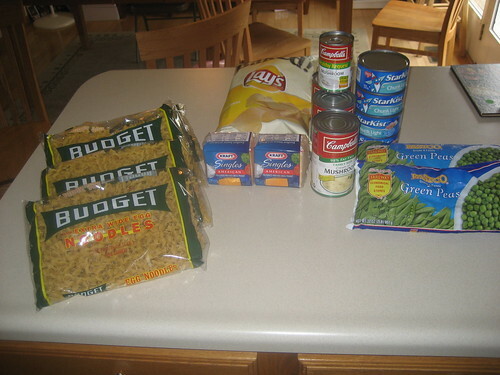 Quite often, the large bulk items aren’t sensible purchases because there’s no good use for the leftovers within the expiration dates. 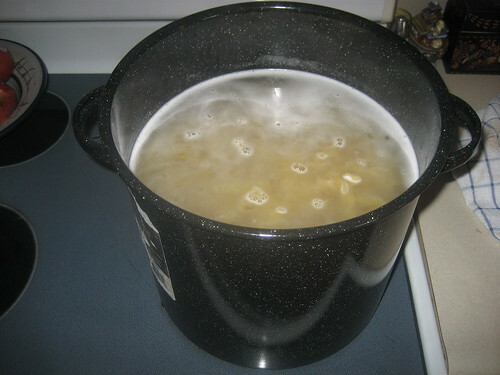 This adds about five minutes extra time because it takes longer for the water to get to a boil plus it takes a bit longer to drain that many noodles. Then we simply add the frozen peas, the pepper, the tuna, and the soup to the mix – I save about 10% of the soup for later use. Stir thoroughly – this usually adds another two minutes or so to the time invested in a single pan because of the challenge of stirring so many ingredients. 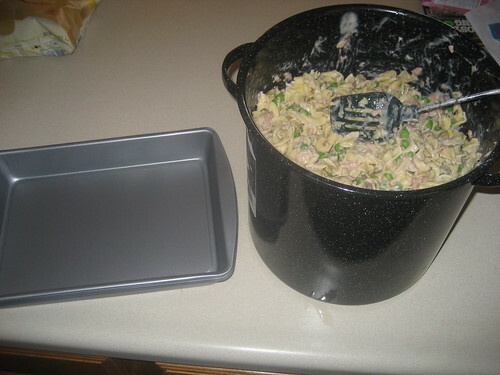 I have four 9″ by 13″ pans with covers that I use for such batch casseroles. I spread the mixture evenly into each pan. Quite often, no matter how much I stir, I find that the noodles near the bottom (the bottom third or so) are drier than the ones on top, so once I’ve scooped out the majority of the mixture into the baking pans, I then add the remaining soup and stir it in before continuing. This all adds about four minutes onto the time of cooking a single pan. I then cover the surface of each casserole with slices of American cheese, then crush a hand full of baked potato chips on top (to add a bit of crunch to the casserole – and a bit of distinctive flavor, too). Almost always, as soon as I finish the first casserole, the oven has just finished preheating, so I pop in that first casserole for dinner that night. Putting slices and chips on the remaining casseroles takes another ten minutes. These three pans go straight into the freezer. Every three weeks or so, I’ll pop one out of the freezer the night before we intend to use it (putting it in the fridge to thaw), then bake it at 350 for thirty five minutes. Let’s say that takes a minute each time, totaling three minutes. 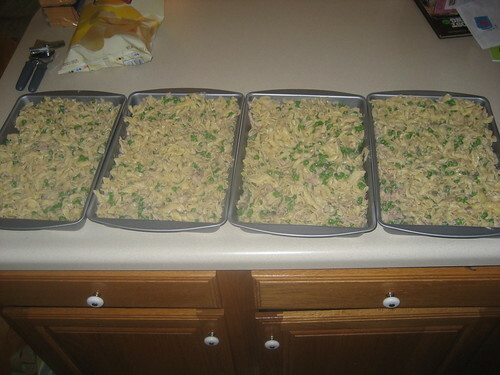 Thus, the total preparation time for making four casseroles at once is 54 minutes, compared to 30 minutes for a single pan. This cuts the prep time per casserole down to 13.5 minutes – a savings of 16.5 minutes per casserole! So, here’s the real result. 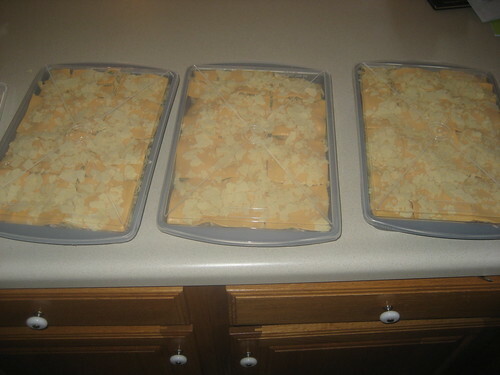 Preparing four casseroles at once instead of just one at a time saves 66 minutes in preparation time and $8.37 in ingredient cost. That’s both time and money straight back in your pocket. The same general principle applies for any freezable entree you might make, from lasagna to chicken parmesan. Preparing the casserole in multiples not only saves you time over the long run, it also saves you money – and that’s the kind of bargain I like.